Who, who, whoooo is that? It’s amazing what you can see in nature if you listen carefully and look all around you. 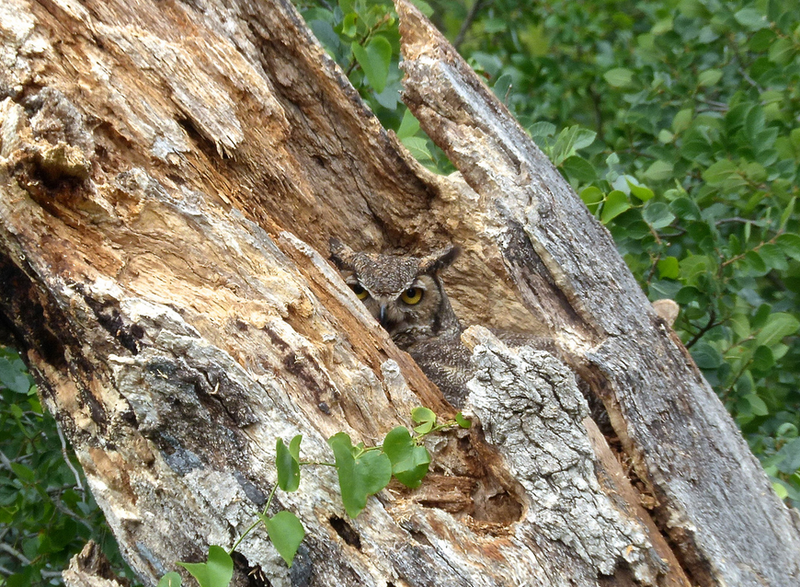 This lovely creature was spotted protecting her nest in an old tree on the ranch where the nature center is located. Notice how beautifully her coloring helps to camouflage her against the colors of the old wood. Mama owl guarding the nest at Reveille Peak Ranch. This is a great horned owl. These majestic birds have the widest range of any owl species, ranging from Alaska and Canada to Patagonia in South America. Naming these birds is easy. The “great” is because they can be up to two feet in height, with wing spans of up to five feet. The “horned” part is because of their ear tufts that look like horns. They are also known the tiger of the skies because they are so large and fierce. This owl is certainly at the top of its food chain! As with other creatures this time of year, the owls are busy raising their young, nesting in tree holes, rock crevices, or even old squirrel nests. 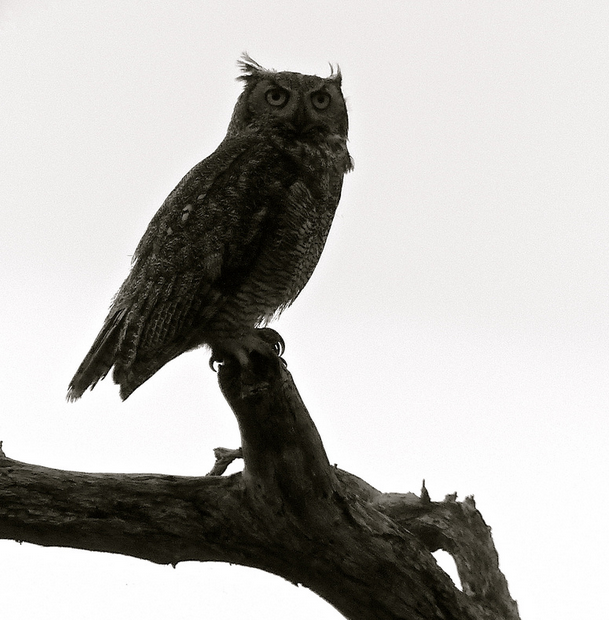 Owls select their mates through a ritual that includes hooting, bowing, and rubbing beaks. These youngsters have yet to grow into their final plumage that will help hide them in the woods during the day. 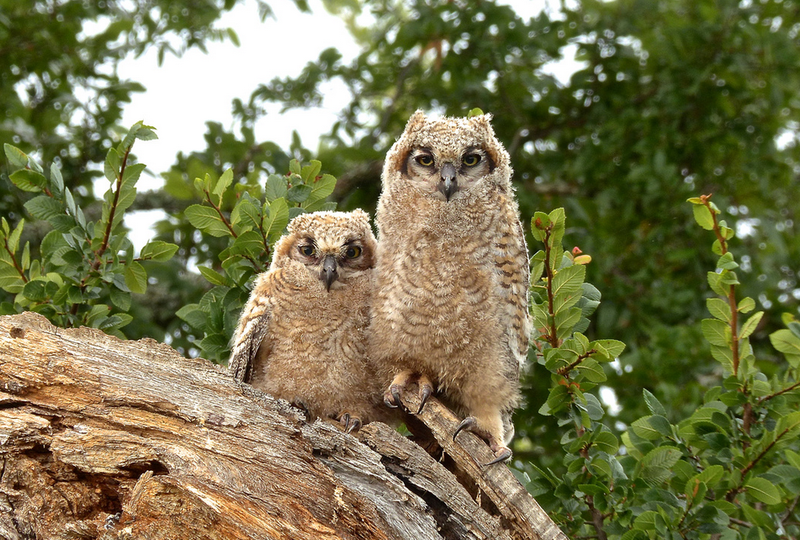 Young horned owls at Reveille Peak Ranch, near the nature center. Did you know that these owls are the only animals that actually seek out and feed on skunks? Can you imagine that? Fortunately, there are other delicacies for owls to choose from such as other birds, mice, fish, snakes, lizards, rabbits and other small mammals they find out and about at night. Parent watching out for young owls as night falls. 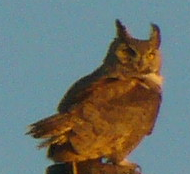 Go out early some morning or late in the evening and see if you can hear a great horned owl. You will know who, who, whooo that is!